SAR testing deals with the thermal effects of human exposure to RF electromagnetic fields. The SAR is a value that corresponds to the relative amount of RF energy absorbed by the user of a device in close proximity to the body. The purpose of testing is to verify that the RF energy emitted by a device is within permissible limits for public exposure as defined by test standards. The measurement system is an easy to use, flexible package optimized for dosimetric evaluation of radio products. The package includes Data Acquisition Electronics and system control computer. Several types of broadband probes and support accessories are offered based on test requirements. These can include probes to measure fields inside fluids simulating body tissue to test radiated emissions from mobile radio equipment, and probes to measure current distribution on radio products in free space. The automated robot positions the probe inside the tissue-simulating liquid over a precisely defined volume. 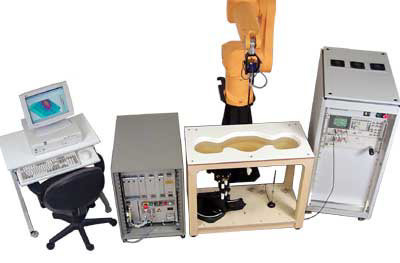 The robot is controlled by a multiprocessor positioning device. A twin phantom Specific Anthropomorphic Mannequin houses the tissue-simulating fluid and is adapted in shape and size to represent the flattened ear of a mobile phone user. It enables the evaluation of left and right hand phone usage. Additional accessories are provided to implement an effective SAR system. The validation system enables test engineers to perform a battery of tests to verify the system operates within its specifications to ensure the accuracy of the complete measurement system, components, and software. The SAR system is controlled by a high-end computer; system software consists of robot control, field measurements with variable output selections, field scans for SAR applications, visualization, predefined compliance testing for 1g and 10g SAR measurements, system validation, and various acquisition modes. Considerations for the Evaluation of human exposure to Electromagnetic Fields from Mobile Telecommunication Equipment in the Frequency Range 30 MHz to 6 GHz.